Last week, an article was published over at No Clean Singing that caught my eye. The article, “A Metal Gender Study“ is a follow-up post by cultural anthropologist David Mollica who put a call out through No Clean Singing last March to recruit participants for his study about gender and metal. Since Mollica’s research is very much aligned with my own work with regard to gender, I thought I’d share my thoughts on his article in hopes of opening a discourse about how gender has been examined in the past as well as how the perspective of women conducting the research themselves can offer different insights than previous studies done by men. Since I’ve had to research a lot of literature on this topic, I found this statement to be misleading and, with no sources cited, I also question the depth of his actual research. In the last decade or so, though statistics may have not shown an exact and equal ratio of men and women on studies like Mollica’s; the fact is there has been research done with women and men regarding the subject of gender and metal. One example is the research done by scholars Leigh Krenske and Jim McKay entitled, “Hard and Heavy: Gender and Power in a Heavy Metal Music Subculture“, in which gendered structures of power in a specific music club within the heavy metal subculture in Brisbane, Australia were studied. In this study a total of 10 participants were interviewed, 6 women and 4 men. Additionally, in my own research, I have referenced academics such as Sonia Vasan from the University of Texas, whose dissertation, “Women’s Participation in Death Metal Music“ was extremely influential on much of my ethnographic approach. Likewise, Sarah Kitteringham from University of Calgary has written and interviewed a variety of women from the Canadian Extreme Metal Music Scene, authoring her findings in her thesis, “Extreme Conditions Demand Extreme Responses“. 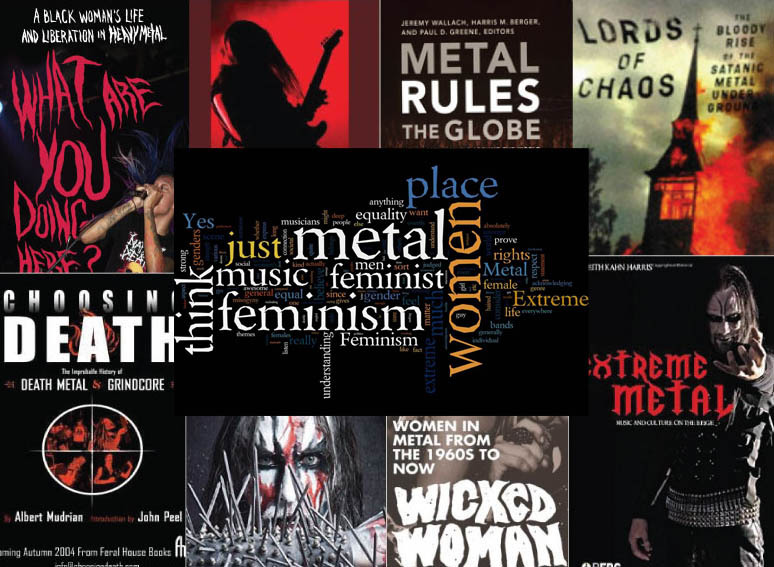 There are other scholars from around the globe – Rosemary Hill, Gabrielle Riches, Jasmine Shadrack, Laina Dawes, Pauwke Berkers, Julian Schaap, and Keith Kahn-Harris – who have written about women in and around metal music. This also assumes one has referenced older and staple academic works written by Arnett, Walser, Wallach, Hickam, Purcell, Pillipov and Weinstein which mention and address different aspects of gender in metal. I’m sure I’m forgetting more. On top of the lack of reference and context (which in Mollica’s defense, was probably due to not wanting to sound too academic on a commercial website), I thought the sample size of 6 and 5 to be small. In my own research, I interviewed – either in-person or electronically – around 80 participants from the NY area alone. If not for the cut-off period instituted by the IRB, there would have been many more – something I will probably use for a follow-up paper. In addition, I’m left wondering about other aspects such as the demographics of his interviewees–Where was this study conducted? How old were his interviewees? What were their ethnicities? What were their educational backgrounds/careers? Mollica points to conducting inductive research, assessing patterns as they arise. While this is a valid form of research, asking and answering such demographic questions is integral to finding out the patterns among his participants. For example, in my study, I found that many of my online participants (which were women only) identified with Caucasian or Hispanic backgrounds. Asians, Native Americans, and African Americans had the lowest representative numbers. This becomes an important part of understanding identity construction, especially within an area like the NY tri-state region which is considered to be quite diverse. Moreover, the women in my study (of which 72 were surveyed online) identified with the following stats: 18% between 18-24 years of age, 56% between 25-34 years in age, 18% between 35-44 years in age, 5% between 45-54 years in age and finally and most surprisingly 3% between 65-74 years in age. Considering age demographics is one way to reveal listening reasons. One can infer the musical styles that would have been around during the participants’ birth years for each age group and what may have been influential as well as what they were moving both away from and towards. Though his interviewees mention this as fact, I and many of my participants witnessed otherwise – at least as the NY-area goes. Interestingly, many of the local extreme metal shows I attended had women attending by themselves. Perhaps this was due to the age of the women I noticed attending; they were often older and more mature, in their late 20’s and on, whereas younger adult women attended in groups, both mixed and unmixed. But, there are reasons outside of metal for this, and men are shown to move with their friends as well. He also talks about authenticity within the metal scene, mentioning the similarities with geek culture and the acceptance of women within that subculture. I agree with his point and would add that this “burden of proof” placed on women to show their true fandom and authenticity elicits a form of tokenism, whereby they become objects which are judged and criticized. Schaap and Berkers work, “Grunting Alone? Online Gender Inequality in Extreme Metal Music”, explains this tokenism within extreme metal scenes, further supporting how sexism is widespread and cultivated throughout the subculture. Overall, most metalheads are probably not sexists who don’t want women in their “club”, as some other research has concluded. The reality is probably more that we bring our ideas about the world to heavy metal when we make ourselves part of the group. I think I’ll have to agree to disagree on this one. For starters, this might be the case for the particular region of Mollica’s study. Since I’m not sure where that was, all I can offer are my own insights and experiences as a woman from the NY tri-state area. Most of the women I met with and interviewed felt that the extreme metal scene in NY was an arena that could be both restrictive and open in its acceptance of women as consumers and producers. 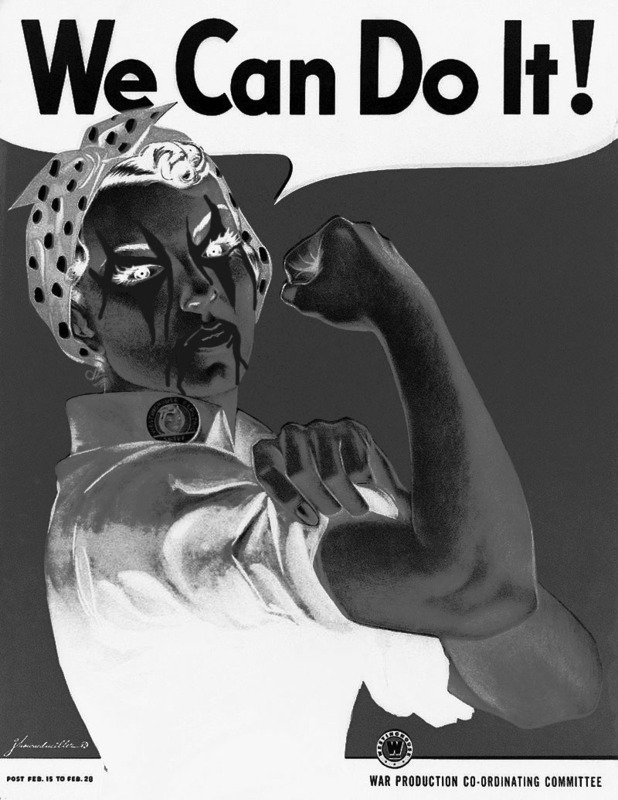 Though many women felt established and included with the community, they also cited the difficulties in getting there. My interviewees cited that their acceptance within the subculture did not eradicate the constant “testing” of their authenticity once there, whether it was being tested as a musician, fan, music journalist, or critic. Many women felt that this openness and acceptance also changed regionally, often telling me that once they were outside of urban and diverse areas like NY, they were more likely to experience sexism, racism and violence at shows. In addition, the construction of the lyrical content does not offer many avenues for the dismantling of misogynist and sexist content. 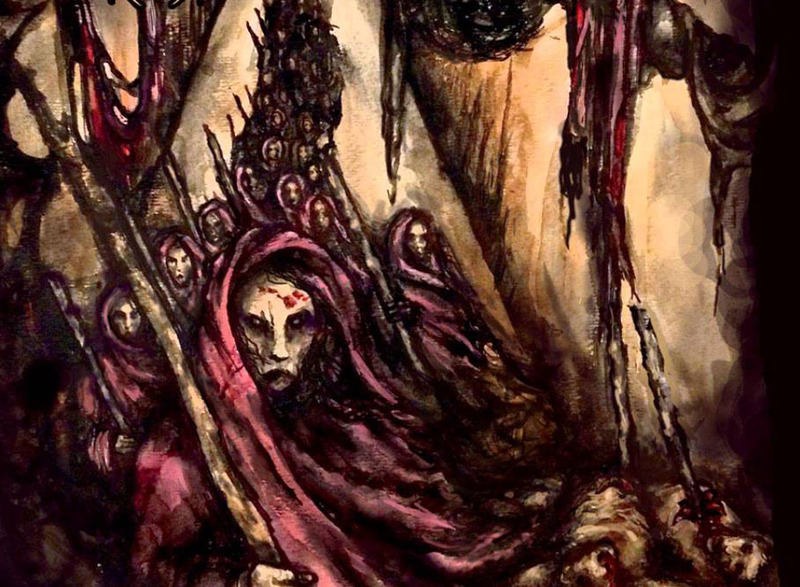 I can only think of NY’s Castrator as an example of a band that has turned traditional death metal lyrical content on its head. Lately I’ve been in a writing rut with regard to my thesis research on women in metal. All the things I usually try to do to get out of said rut are failing. I went to Yoga, started reading material not pertaining to my research, and I even thought about painting again; anything to get my mind off schoolwork. Instead, while browsing an old sheet of notebook paper with ideas about possible thesis topics, I ended up revisiting this idea I had when I was pregnant with my daughter, Ella. It was on researching mothers and motherhood in heavy metal. I decided to give more time to researching this topic. During the course of my research with women in NY’s extreme metal scene, the concept of motherhood came up a handful of times, both during the one-on-one interviews and in the online survey. In general, women said that future motherhood would be a challenge to them simply because of the lifestyle change. A few said that they look forward to figuring that lifestyle change out, while the majority of my interviewees said it wasn’t in the cards, mostly because they couldn’t see themselves as both musicians and moms. I found this bit intriguing, as I bet male musicians rarely think of this concern, or at least, not in the same way. It’s not like they would have to be drumming insane blast beats while being 7 months pregnant or anything. Motherhood and metal also became a reoccurring theme in my daily WordPress musings because 1) I’m a newish mom myself and so I follow parenting blogs here and there (see beautiful pic of my daughter below) and 2) women in my age group are starting to settle down and have children. It wasn’t surprising that when I read a review of Kim Gordon‘s forthcoming book, Girl in a Band, I was immediately fascinated with her memoir of life on the road as a musician, performer and new mom. As a rock icon, I definitely look forward to reading her book. To add, motherhood and balancing everything else is a challenge that Gordon seems to have successfully managed. It’s amazing to me that the topic hasn’t really been explored. Considering that all these musicians came out of somewhere, you’d think the topic of moms and motherhood would have been researched. There’s a dearth of information about home environments and adolescent studies with regard to reasons for listening to metal and it looks like there’s little on the way about mothers and their influences on these musicians. I would like think that in one way or another (whether it’s positive or negative) it would be highlighted. On that note, I unfortunately found this video while I was researching that made me upset. It’s a recording of a conversation between a mother and her musician-son..well sorta. Understandably, we don’t have the entire context of why this mother felt so disgusted with her son. I’m sure anxiety and being afraid of something she didn’t understand played a big role in her reaction but it was disheartening to see the approach she took in addressing her son. And yet, over at places like the Jarakarta Globe, psychology lecturer Gita Soerjoatmodjo writes on her experience of being a mom who doesn’t feel a need to reconcile being a metalhead with parenting. She references society’s perception of metal music and talks about, how for her, it’s an empowering and constructive force, not something to simply be rebellious or violent about. So it goes without saying, while I’m on break with my thesis work, you’ll probably see me writing something researchy about what it means to consider motherhood within the heavy metal community. If you’ve been following my research all this time, you’ll know I’m a big scavenger of all things NY metal. A lot of my research hasn’t only been about the women in NY’s extreme metal scene but to the overall subculture in general. As of late, I’ve been looking at venues and their histories involving where metal and underground shows were taking place back when extreme metal was growing. After all, the subculture had to be existing somewhere! One such place that was brought up to me was L’Amour. Back in November 2014, I met a fellow presenter at the Metal and Cultural Impact (MACI) Conference who was from Jersey, presenting on Metal and the USSR. He told me about L’Amour, a venue in Brooklyn’s Bay Ridge area that closed down in 2004. Sadly, it was a place I never got to venture to because I really had no connections to the metal scene in the boroughs during my teens. My relationship with metal only became serious in my mid-20’s, during college and beyond. And to add, in the 1970’s when they were having some of their awesome shows, I wasn’t even born…so yeah. 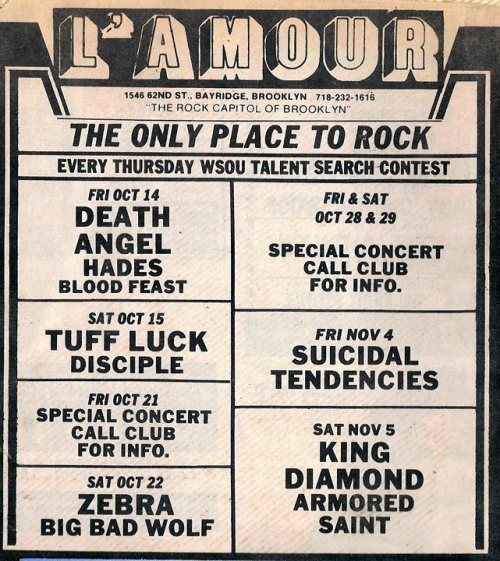 What’s great is that just like Metal Kingdom, the Queens venue that I mentioned in one of my earlier posts, L’Amour also catered to others in an otherwise small and marginalized scene of underground music. It’s closing most likely led the same crowd to start hanging around at places like Metal Kingdom. It wasn’t until 2010-2011, that Saint Vitus and Acheron, both Brooklyn venues opened their doors. These venues allowed for folks to find a place to connect and participate in something that larger society just did not get. Moreover, what made going to such a venue exciting and provocative was the surrounding air of the beginnings of the extreme metal scene. Early shows debuted what would later become a who’s who of metal royalty, including bands such as Metallica, Megadeth, Slayer, Anthrax, Iron Maiden, King Diamond and Overkill. I thought it was pretty neat to find wordpress blogger Maya over at VisuaLingual post a write up about her experience and time with L’Amour. She makes a beautiful case of women participating in the scene during the 90’s, when the number of women were even fewer than today. 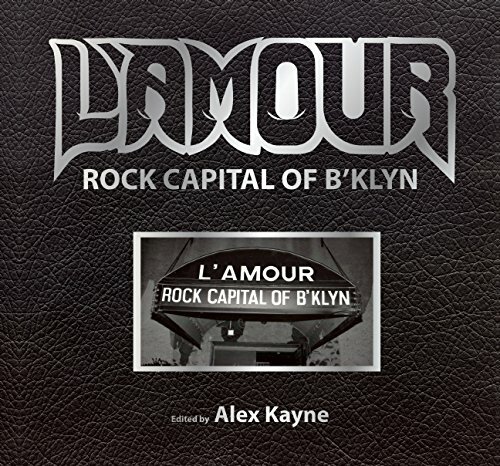 And finally, my librarian self was happy to see a book in the works by resident L’Amour DJ, Alex Kayne called, “LAmour: Rock Capital Of Brooklyn” to be published in 2016. I’m sure it will stand to be a significant work of reference for other metal academics like myself. 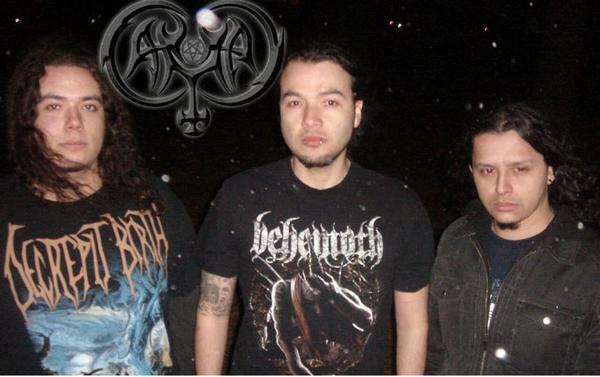 Over at the Daily News website, I found an interesting article written back in 2009 regarding Latino Metalheads from the NY metal scene. The post was entitled, Metaleros’ journey: Meet N.Y.’s thriving Latino metal scene and written by Daily News journalist, Ana Maria Toro. The article talks about demystifying the stereotype that all Latinos listen to, or play Merengue, Mariachi and Salsa music. I was glad to see some spotlight, however little, was given to this subject. 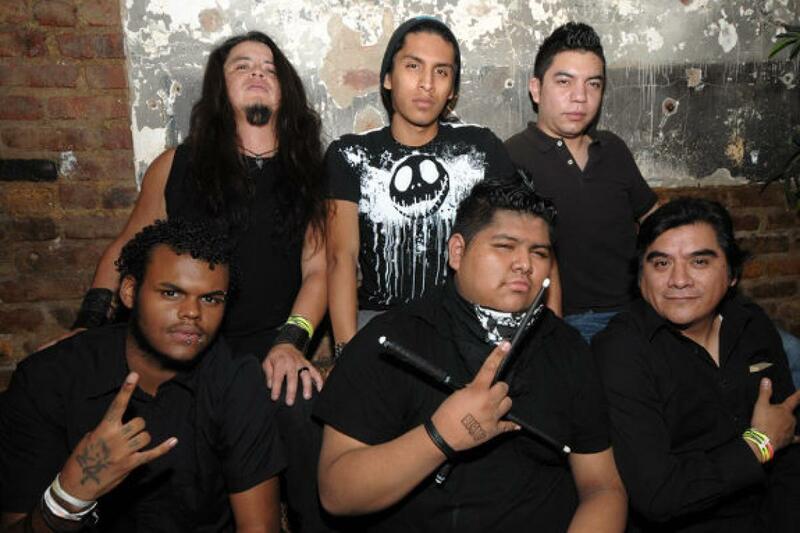 Toro goes on to interview several Latino musicians and promoters and sheds light on the popularity of Metal’s global reach south of the border, relaying how Metal music is pretty popular in many Latin counties. In regards to what Latino musicians find appealing with metal, one interviewee cited how performing metal has been cathartic in relieving anger and marginalization through displaying musicianship and talent. Nothing cited was surprising to me, as the genre has often been described as transgressive. Though it’s not an in-depth article of any kind, I thought it was interesting that this particular post was even written, considering there seems to be little, by way of online articles, about New York’s Hispanic and Latino metal scene. Not surprisingly, it’s even more difficult for me to find articles regarding the Hispanic/Latino women involved within the NY metal scene–by far the largest demographic present at shows outside of Caucasian women. This may of course be due to a language barrier while I’m researching. Perhaps there are Spanish forums with active female participates talking about metal; something for me to further investigate and bring to light. As a librarian and metalhead, I’ve often wondered what musical tastes my fellow colleagues had. Recently on the ALA Think Tank page on FB, this same question was asked by another librarian. What ensued in the comments was of course a natural variety of musical tastes, ranging from country, rock, punk, new wave, classical and metal music. It made me research Facebook to see if there was a group or page for librarians who were also into metal music. To my surprise, nothing showed up. 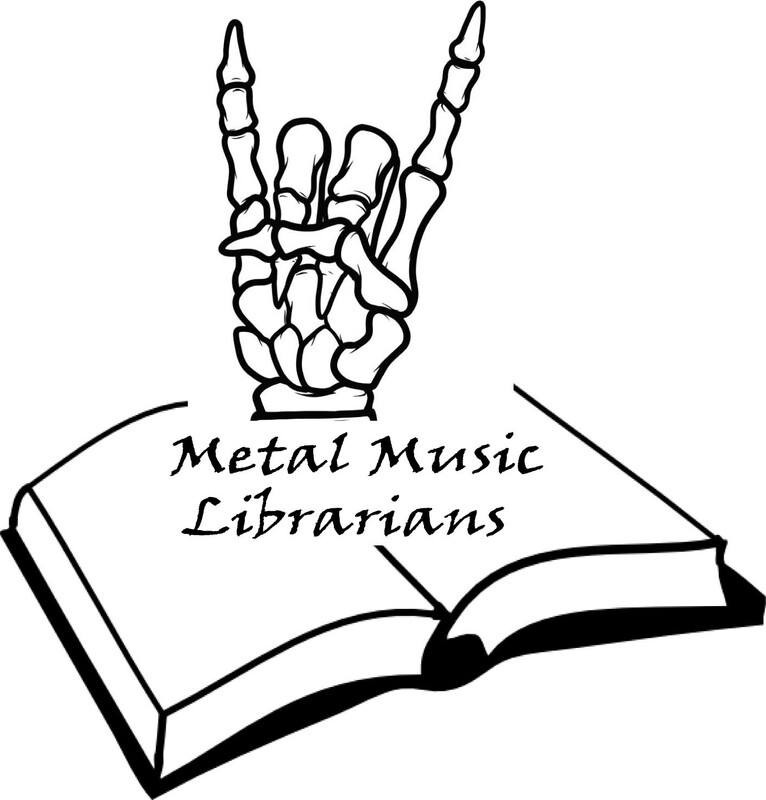 This inspired me to create a Facebook page for my fellow metalhead librarians, hence the birth of Metal Music Librarians. It shouldn’t really come as a surprise to folks that there are librarians interested in metal music. I’m sure amongst the music librarians association, there is a plethora of librarians listening to all kinds of things like shape note music or opera or djent! As I’m constantly researching and writing about metal, I figured this would be another great avenue of disseminating and learning about all things metal. I mean, who better to get metal music information from, than a librarian??? They’ve done an excellent job over at Boing Boing with a post compiling The Best Heavy Metal Movie Posters. The librarian in me was ecstatic to see material culture of this kind get featured. Highlighted are some very cool posters from which famous bands appropriated some imagery; i.e. The Misfits and Black Sabbath. 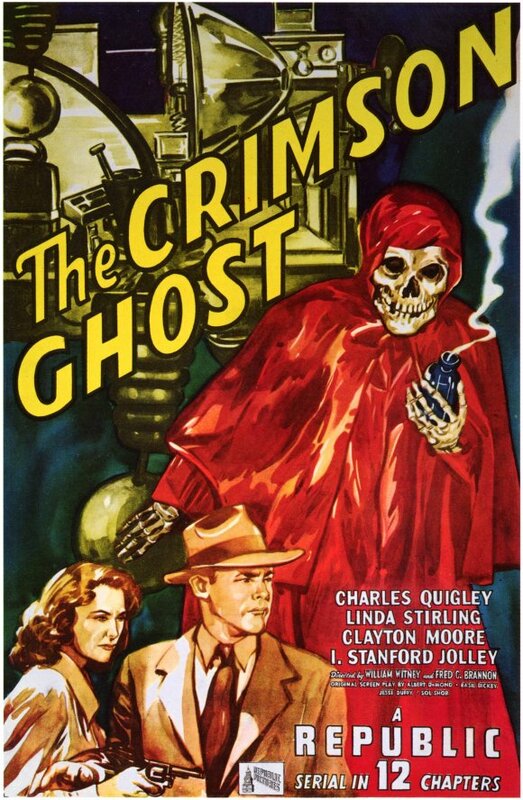 Of note, was the movie poster for The Crimson Ghost, a 1946 horror movie that was directed by Fred C. Bannon and William Witney. In particular is the poster which features it’s main villain as a skeleton robed madman–exactly the image that Danzig and the Misfits appropriated for all their merchandising needs. 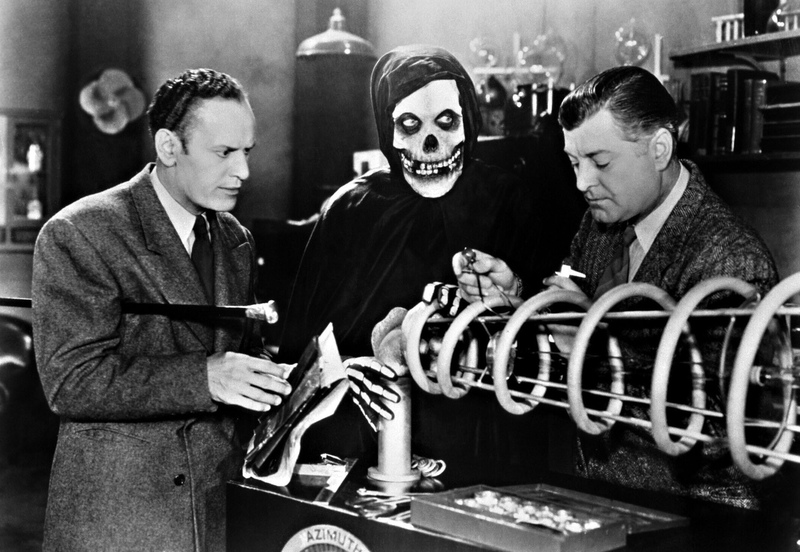 The film centers around an obscure villain who has stolen an atomic death ray type of machine that can short circuit anything electronic, ensuring a healthy dose of havoc in its wake. 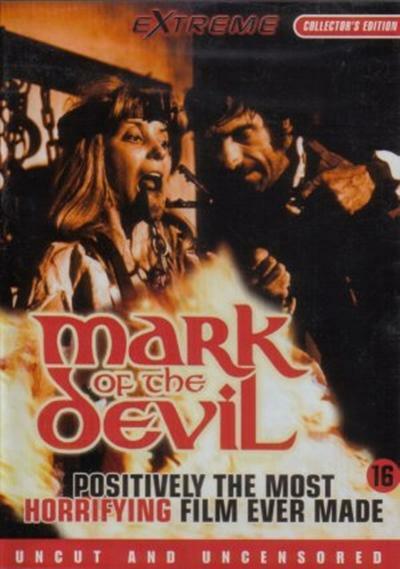 Another film mentioned in relation to bands was the Italian-French horror movie and name inspiration for Ozzy Osbourne’s Black Sabbath. 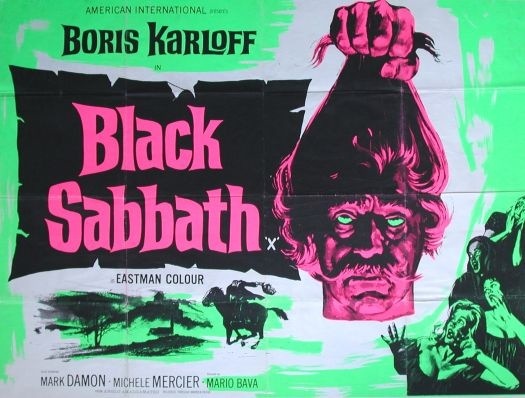 Released in 1963, Black Sabbath was most famous for Boris Karloff as it’s main commentator. He introduces a trilogy of tales, The Telephone, The Wurdalak, and The Drop of Water, all staring an international cast of actors and actresses. Seductive imagery of naked women on stakes looking like witches add to the sexual horror inducing hilarity of this genre. I couldn’t help but this amusing. As a librarian, I think it would be a dream job to be in charge of a poster collection that included anything obscure and offbeat like these posters. Often times people forget the value of material culture and it’s influence on other genres of creativity. Ironically, with the advent of technology, imagery that was once seen glossing the covers of album records, CDs’ and posters have given way to something less creative and I can’t help get nostalgic for the lost medium. In any case, I think I found a new hobby. I came across an interesting interview the other day over at Invisible Oranges on the male to female transition of one of the members in the heavy metal band, Cretin. The interview was posted in June of 2011 so I’m sure I’m pretty late on the news, but I guess that’s bound to happen when your knee deep in researching and learning new things. I added this tidbit of information into the “learning new things” category. Although it’s not about women and their participation in the Metal Music community, it’s of course related and is actually quite a fascinating read! I was drawn to this interview because I wanted to know first-hand what kind of challenges Marissa Martinez, formerly Dan Martinez, received upon coming out to the metal music community. From the interview it looks like most of Martinez’s hesitations were internal and that the metal community didn’t react or treat her horridly. Though it wasn’t an easy transition it seems she was able to, with support of her ex-wife and band-mates, experience a therapeutic and cathartic transformation. I’ve seen that the majority of the time this isn’t the case. In one comment, Martinez says that she was approached at the 2011 Deathfest by supportive fans who knew her pre-transition and that some young girls who were new fans had said that it was awesome to see a woman who could grind. This of course made Martinez laugh and only supports the fact that Metal still has its marginalized groups that exist within it. I think the most surprising thing I digested from the interview was Martinez’s upbeat and optimistic attitude. I thought it was great that her story had a successful outcome, one where she had great support from her fellow band-mates and her fan base. It was great to see she wasn’t only striving to produce creative music but that she took an active role in participating in the transgender community and speaking out about her experience.